Dress up any gathering with a sophisticated dessert arrangement Impress your guests with this stunning Acrylic Cupcake Tower by YEST Baking. 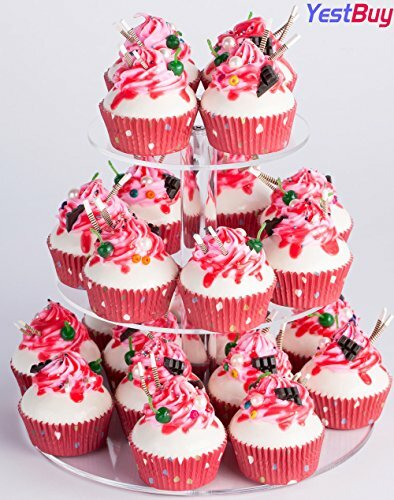 This elegant 3-Tier cupcake tree is perfect for hors d'oeuvres, petit fours or as many as 23 standard-size cupcakes. Serving a delectable selection of treats on this sturdy dessert stand makes an eye-catching centerpiece, while optimizing table space at weddings, birthday parties, baby showers and corporate meetings. Versatile and durableThe YEST 3-Tier Cupcake Tower uses sturdy 4mm acrylic on a central rod design for the most stable and reliable cupcake stand. This also gives our cupcake tower superior scratch and impact resistance to prevent breakage. Our handy party accessory assembles in minutes by screwing together the center rods of each tier. Assemble only as many tiers as you need, whether it is 2 or 3 tier. Roomy 4" clearance between tiers let guests serve themselves without disrupting your arrangement or knocking anything onto the table. Overall dimensions when fully assembled are 8.7"H x 10"W x 10"D, and the 3 individual tiers have diameters of 6", 8" and 10". Clean your disassembled YEST Cupcake Tower easily in your dishwasher and then store flat in a kitchen cupboard. Your entire kit contains: 3 tier plates; 2 rod pillar assemblies; 2 head screws;1 double screw; and 4 non-marring rubber feet. Add the YEST 3-Tier Acrylic Cupcake Tower to your cart today, and turn any gathering into a memorable event. STRUCTURE : Could be removable as a 3,2 tiers cupcake stand,each acrylic plate can be assembled freely. View More In Cupcake Stands.